If the PlayStation 3's Eye of Judgment ever got drunk and made some bad decisions in Tokyo's nefarious Kabukicho district, the resulting offspring would probably resemble this Cyber-Maid Augmented Reality device from Geisha Tokyo Entertainment. The "Dennoh Figure ARis" (Cyber Figure Alice), on sale this fall, will come with all manner up alternate reality upskirts, strip teases and "augmented" promiscuity. And yes, because you asked, it comes with a virtual poker. Alice comes with two marked cubes and two similarly marked sticks. 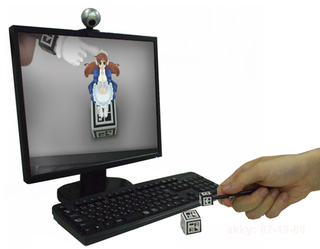 Using a webcam to track the cubes and sticks, the software displays your personal maid onscreen. You can then use the sticks to, well, this is perhaps best said in pictures.